Come and Get It Fire Ant Killer kills the Queen & the Mound. No Mixing. Dead Ants in 24 Hours. No Watering Necessary. Contains a bait that attracts foraging fire ants and is redily taken back into the nest as food for the colony. 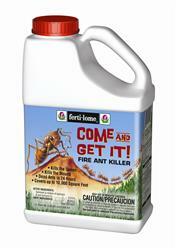 Would you like to see the Come Get It Fire Ant Killer Label? How about the Come Get It Fire Ant Killer MSDS sheet?